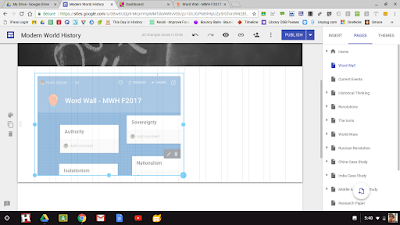 When I learned that I will be floating to different classrooms next year, my first concern was how I could adapt some of the wall hanger activities to a more mobile situation. I have magnetic tape on a lot of things, but the ability to display content long term is not happening next year. 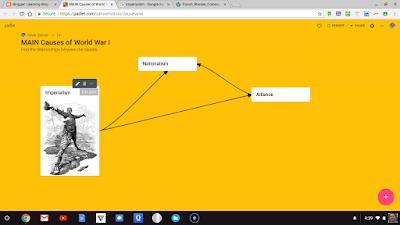 I soon realized that my course websites are the only places my students can count on for things like word walls, current events, and skills expectations. 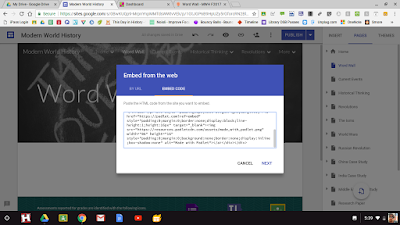 Luckily for me, New Google Sites released an update that allows users to embed HTML code. 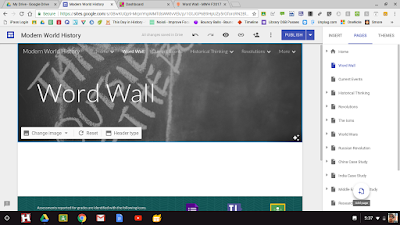 My first task was to work on the word wall. 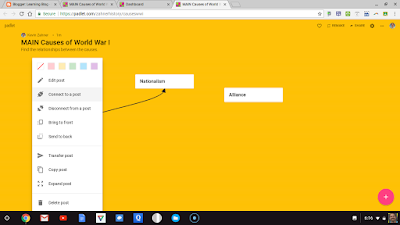 I chose Padlet because it's been useful in the past. 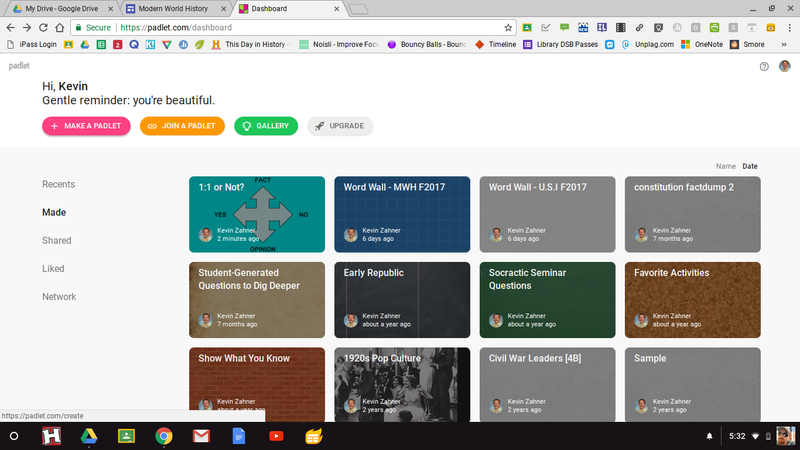 Plus, Padlet will allow us to do more than just post words for learning activities. 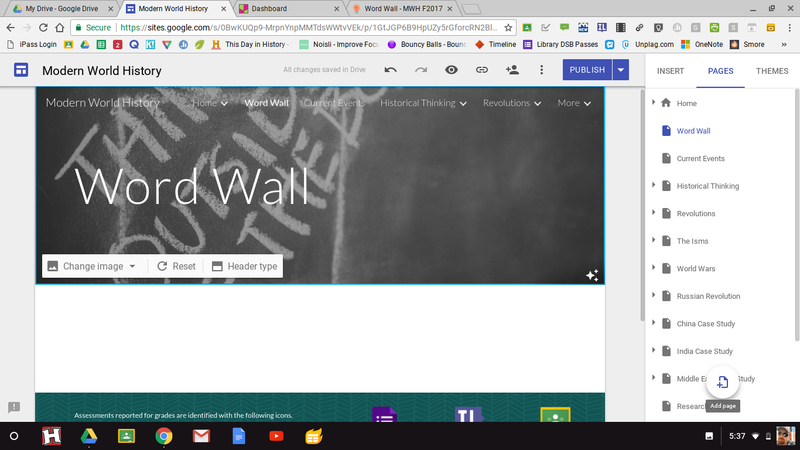 Here's what I did to embed the word wall ... and a few tips. 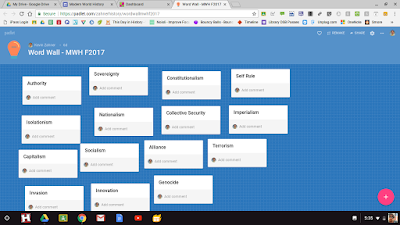 If you don't have an account at padlet.com, I suggest making one connected to your Google account to avoid adding another username and password to your list. Once you have your account created, log in and make Padlet. The settings and customization options are in the upper right. Play around. It's fairly intuitive. 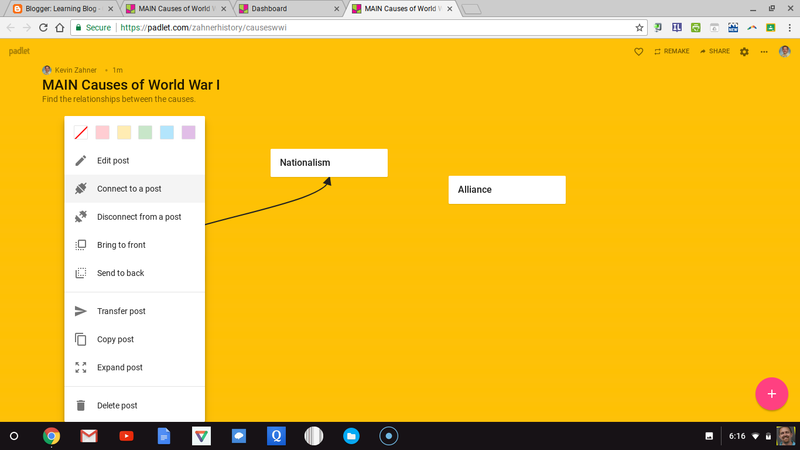 To add words, click the plus button in the bottom right or double click anywhere on the Padlet. Click, hold, and drag to arrange the words if the Padlet is in the canvas arrangement. The canvas arrangement allows users more control over placement of the items. 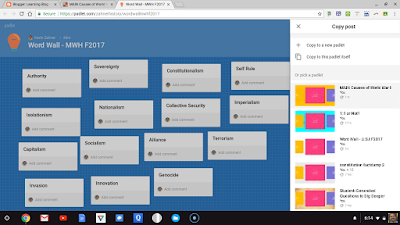 Other arrangements are more organized, but I like the canvas because it gives us more opportunities to organize words according to whatever parameters we want to explore (see the ideas at the end of this post). The embed code can be copied from the settings menu that opens from the right side. Making new pages is quick and easy. Go to the pages menu on the right and click the add a page button at the button. In the white space, double click and choose the embed icon at the 9 o'clock position. This opens the embed options. Choose embed code, and paste the code from Padlet. 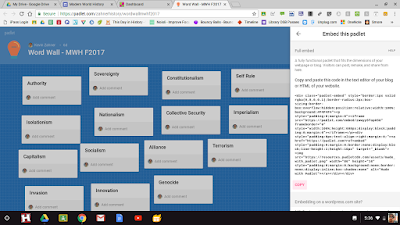 I like to drag the Padlet as far right and left as possible and as far down as the Padlet extends. This is my favorite part. I always check the site page when significant changes are made because mistakes can be major distractions during a lesson. Plus, I get to walk in my students shoes a bit with hopes of learning how to better facilitate their learning. 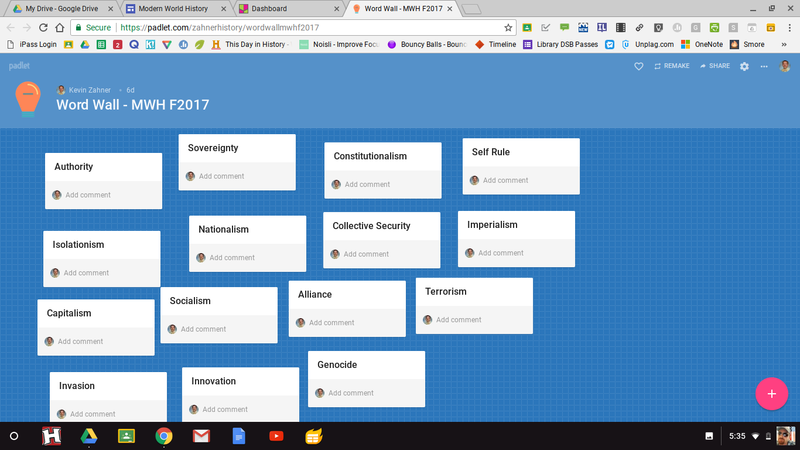 If you hover over a Padlet post, options pop up. 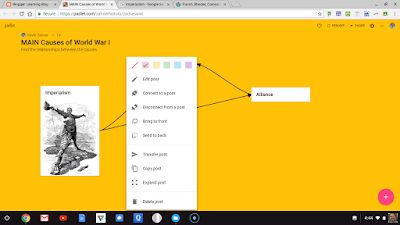 Click on the three horizontal dots for more options and choose "copy post." 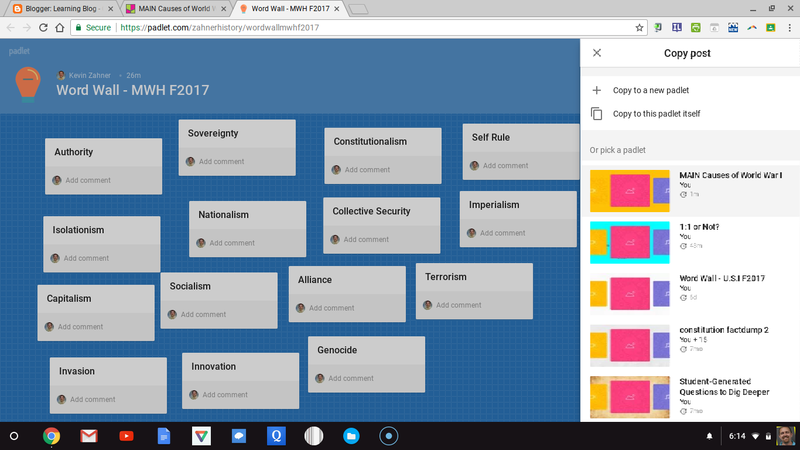 This opens a list of your Padlets on the right from which you can choose the destination. 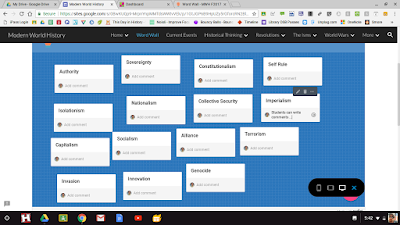 If you want students to build detail around a word from the word wall, copy the word to another Padlet where they can share ideas and deepen their knowledge. 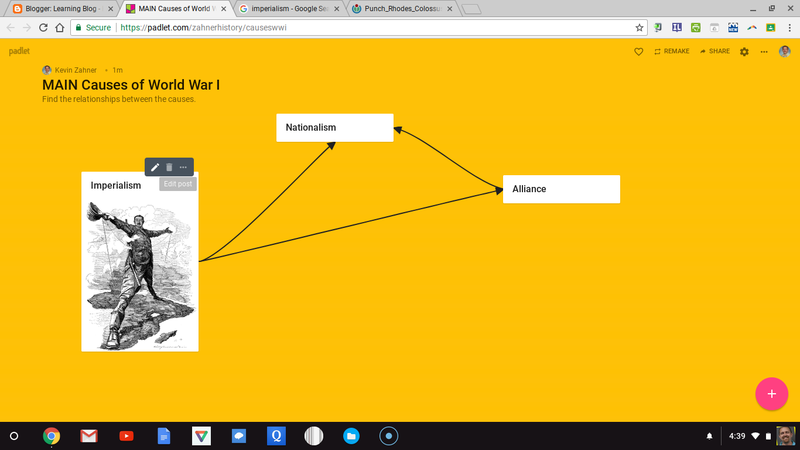 I made this Padlet below to explore the "isms" that set up the conditions leading to WWI. Images are so powerful. My students leave my class having searched for images that relate to our content at least three times per week. 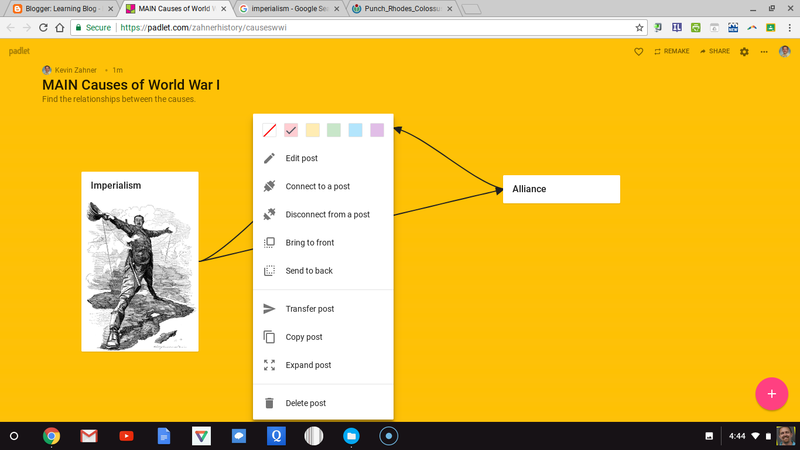 To add images to a Padlet post, click the icons on the bottom the post and grab an image URL to paste in the menu that opens from the right. Whether it's nouns or verbs, carnivores or herbivores, similarities or differences, rational or irrational numbers, or fact or opinion, color coding is visual, fun, and great processing for young brains. These skills support formulating arguments and writing thesis statements. It also helps kids develop organizational skills for memory or managing material possessions. Hover over the post and click the three horizontal dots (more actions). Choose the color at the top, and discuss it with the class. Nice blog, your work is great and I hope for some more nice posts. Continue writing such a nice blog. It’s hard to discover fantastic composition like yours nowadays. best public school in delhiAnd also here I got new ideas and guidelines. Thank you so much for your great sharing.